The fact that Liam Mellows was imprisoned in New York for endeavouring to buy arms from Germany, was fired from his job as a journalist, and kicked out of the Fenian movement was an embarrasment with many of his admirers. He infuriated old Fenians by urging Irish Americans not to join the army to fight for Britain on the battlefields of World War I.
Mellows after all had shown real leadership and organisational ability in bringing out some 700 volunteers in Co Galway during the Easter Rising. It was an impossible task without proper weapons; and the British reaction was swift and decisive. The volunteers were quickly isolated. Not only did the citizens and garrison soldiery block every entrance into Galway town, but more troops were rushed to the area. The naval vessel The Laburnum began bombarding the coastline at Maree and Oranmore from the bay, which must have caused anxiety and fear among the unarmed men. It all ended with disbandment, the arrest of the volunteers, and Mellows’ escape to America. After an initial welcome where Mellows was feted as a hero of the Rising, it all went sour as Mellows continued his war against Britain. 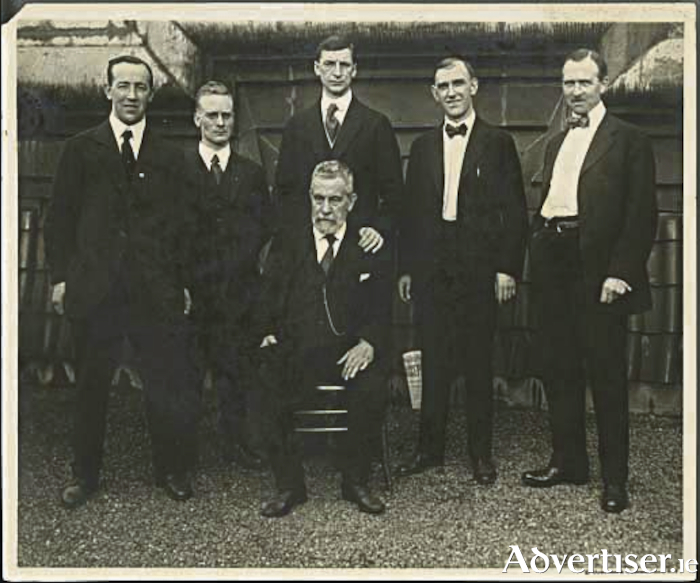 He fell out with Clan na Gael and its leaders, the veteran Fenian John Devoy, and the ambitious Judge Cohalan, when he campaigned against Irish Americans joining the army, a policy opposed to the Clan’s efforts not to isolate itself from mainstream American politics. Mellows lost his job on Devoy’s newspaper The Gaelic American. He eventually found work as a labourer which did not suit him. After his imprisonment he collapsed from starvation. The fact that Mellows had actually starved was seen, by some, as a slur on Irish America. It was hotly denied by a friend Frank Robbins. He admitted Mellows did not look after himself; but any stories about him starving ‘had no basis or foundation, and was a terrible libel on our good Irish folk living in New York. Not one of whom, no matter how strongly they might have disagreed with him, would not have done everything possible to help him during his illness’... Finally a Mrs McCarthy, a member of New York Cumann na mBan, and a nurse, helped bring him back to good health. Events took a dramatic turn one evening, when, totally out of the blue, Eamon de Valera knocked on his apartment door. Eamon de Valera’s name was not far from the hearts and minds of Irish Americans. He was an American himself, and one of the great survivors of the Irish Rebellion. He was 33 years old, a lecturer in a teacher’s’ college at the time of the 1916 Rising. Condemned to death and reprieved, he was the senior commandant to have escaped the firing squad. After a year of militant defiance in various British prisons, he emerged a symbolic hero, and was accepted with acclamation as the leader of the forces of independence. He was elected president of Sinn Féin, and after the 1918 election he was elected to the new Dáil. Arrested again he was imprisoned in Lincoln jail, until he spectacularly escaped, dressed as a woman, using a key smuggled into him inside a cake. The escape was organised by Michael Collins. De Valera intended his American visit to be brief. In fact he stayed from February 1919 - to June 1920. On the eve of the War of Independence the new Dáil realised that if it were to be recognised as a legitimate government, capable of achieving a realistic programme of development, it needed substantial funds. Dev’s job was to float a loan among wealthy Irish Americans. There was yet another reason. This was the time of the Peace Conference in Paris where Britain and France were busy carving up a defeated Germany and the old Ottoman Empire. Dev knew that the recognition of Ireland as an independent sovereign state was far from their consideration. He wanted to appeal to the American people, over the heads of Paris, that Ireland was a small independent nation fighting for freedom. Because he was still a wanted man, Dev’s journey to America was a strictly kept secret. This was the first time he was back in New York since the age of two years. Yet his first visit was to see Mellows. Perhaps he had heard how Mellows had been treated. Dev would have known how committed and determined Mellows was. It was typical of Mellows that just because he was safe in New York he would not stop being a fighter for Ireland. And in turn Mellows surely warned Dev to be aware of the personalities and internecine politics that existed among the Irish American societies. Then Dev went to his mother’s home at Rochester, where he was greeted by a cousin, Mary Connolly, one of his aunt Hannah’s daughters, who immediately ran to tell her family. * Word was quickly spreading that Dev was home. John Devoy and Judge Cohalan must have thought that all their Christmases had come on the same day when they heard that de Valera himself was in New York. A massive press conference was organised at the Waldorf-Astoria hotel. On the day a great crowd had waited for hours, completely blocking Thirty-third Street. As Dev stepped from his car he was met by Devoy and Cohalan, one carrying the green, white and orange tricolour of the Irish Republic, the other the Stars and Stripes of America. The crowd burst into applause and shouted and cheered their welcome. De Valera truly had come home. But despite the smiles of Devoy and Cohalan, and their protestations of support and loyalty, and how they were at the service of the Irish Republic, etc, etc, like with Mellows the relationship was soon to end with the utmost acrimony. Next week: Dev outfoxes the old Fenians . NOTES *Eamon de Valera (1882 - 1975 ), was born in New York City, the son of Catherine Coll, an Irish woman originally from Bruree, Co Limerick, and Juan Vivion de Valera, who was born in Spain. After his untimely death, his mother was in poor circumstances. She sent her two-year-old son to Ireland with his uncle Ned, where he was reared in Bruree by his grandmother Elizabeth Coll, her son Patrick, and her daughter Hannie.